This past weekend I saw something I had never seen before. No, I did not see an elephant fly or even a needle wink its eye (something about that phrase brought out the Dumbo fan in me). What I saw was a little more disturbing than that. It was a bit of animal behavior that had since escaped my notice. Ok, ok! Enough stalling…. 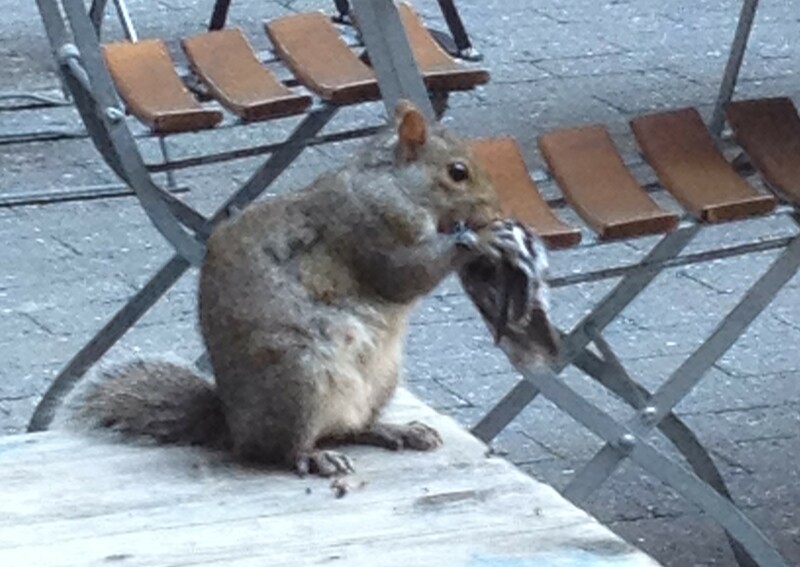 I saw a squirrel pick up something to eat off the ground and that something was a dead bird!!! Now I’ve been around squirrels my whole life. how did I never see them eat another animal before? Of course I had to google this to see if this was some sort of aberrant behavior or if it was actually common. 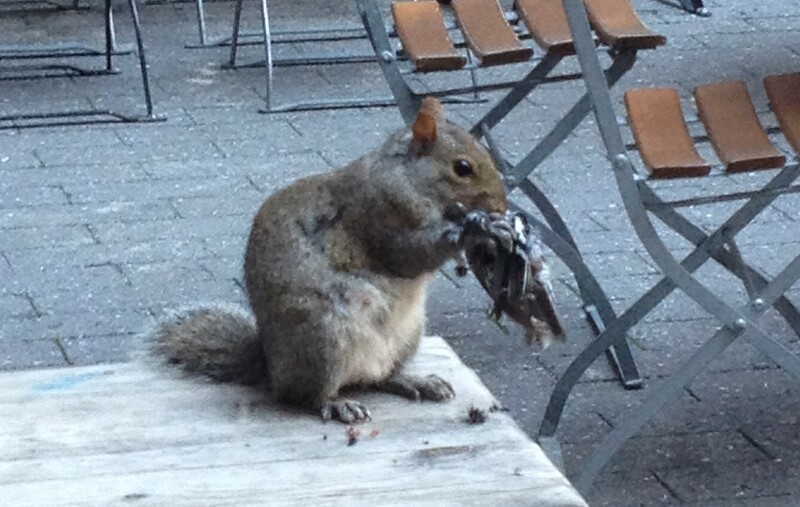 As it turns out, it’s actually not that uncommon for some squirrels to rob birds nests and eat their eggs or young. They’ve even been known to take down an adult bird or snake. From what I can tell, it varies by species and some species consume meat more regularly. 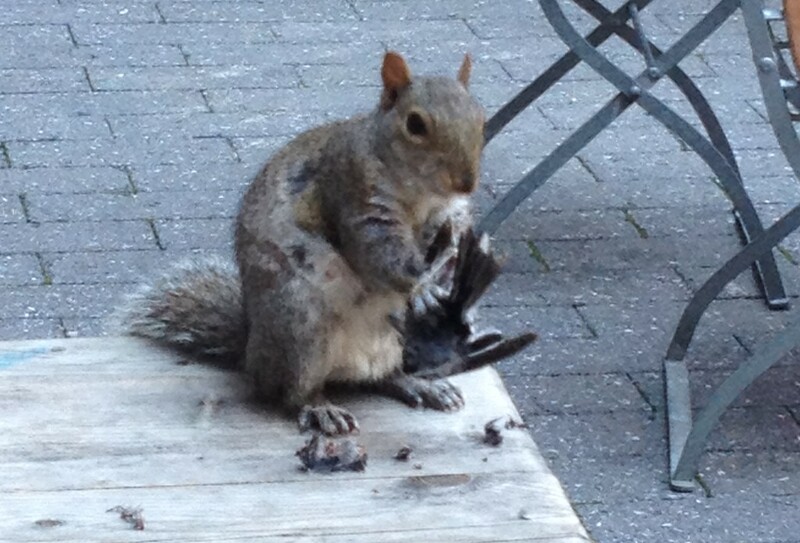 Although I think nuts and buds are their preferred food source. It’s amazing to think that something as common as a squirrel can still cause a surprise. What else don’t I know about the things around me? What have I just assumed was fact? One thing I do know though, is now I understand why I don’t see any dead birds in NYC, they are just a part of the food chain. Here are a couple more shots. Sorry they are so poor quality. I only had my iPhone with me and I had to go into digital zoom territory.